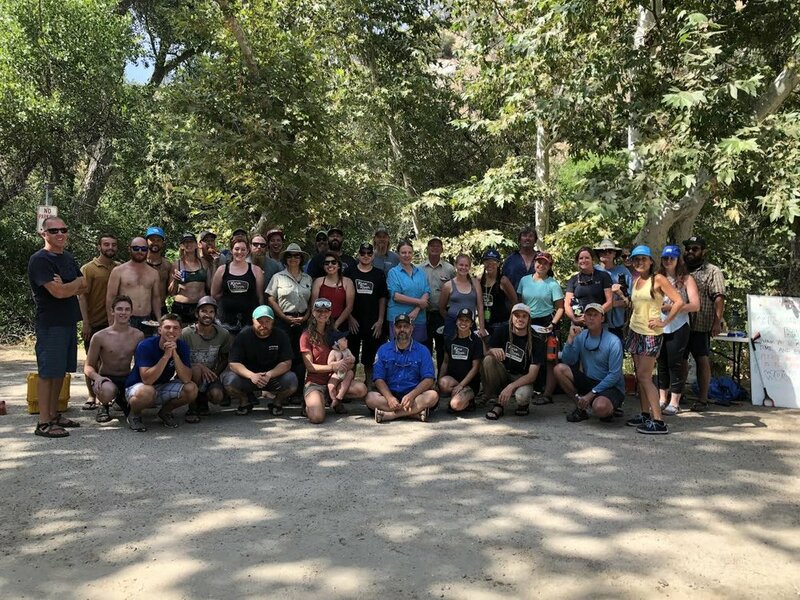 We participated in a large scale joint effort to clean the Lower Kern River with the U.S. Forest Service Kern River Outfitters Kern River Tours Whitewater Voyages and Mountain & River Adventures. This project had been discussed numerous times over some Just Outstanding IPA's at Kern River Brewing Co. I'd say maybe over the course of two years we've met and discussed planning and logistical ideas. Kelley App with Kern River Outfitters took the bull by it's horns and led the charge in planning and coordinating four outfiiters, the Forest Service and Kern River Conservancy. We worked hand in hand with Marcella Lopez who is a recreation intern here in the Kern River Ranger Distrcit. Most of our target areas for trash and graffiti are not accesible by foot and can only be reached by raft or kayak. During our last drought, water levels were so low that campers were able to walk down the river in areas not designated for recreation and felt the need to vandalize these prestine areas. Now with water higher water levels and concerns for safety, we decided to utilized whitewater rafts and guides to transport our volunteers down river safely. With over 30 volunteers and 10 rafts we scattered over a 20 mile stretch of river starting from Keysville to Democrat. More than 1200 pounds of trash was pulled out of the river by volunteers, raft guides, kayakers and forest service personnel. Newer PostBuilding the Next Generation of Wild & Scenic River Protectors.